Biological membranes play a great role in most processes occurring in the cell and determine substantially the cell's response to changes in the surrounding medium. 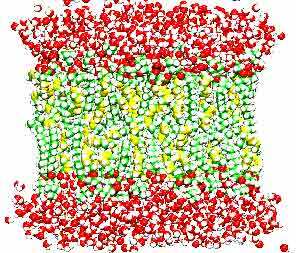 In recent years the Institute of Mathematical Problems of Biology, RAS in collaboration with the Institute of Biology, RAS (Karelian Research Center) have been engaged in modeling bilayer lipid systems by the MD method. The work has been repeatedly supported by the RFBR grants. The base of a biological membrane is a lipid bilayer. Its properties determine the functioning of a biomembrane per se and the cell as a whole. Lipid molecules are heterogeneous as to the make up of their polar groups and hydrocarbon chains. Of special importance are, probably, molecules with polyene tails. Notwithstanding the fact that the studies in this field are proceeding vigorously, the deficit of experimental data on the systems in question is still acute. Computer experiments allow better understanding of the role of polyene lipid molecules in the biomembrane functioning. Calculations with the use of supercomputers hold considerable promise as regards getting of new data and opening up of new fields of application. Screenshot of a phospholipid bilayer in the process of its modeling. Shown is a computational cell consisting of 96 PhCh molecules and 2304 water molecules which on the whole make up 20544 atoms.